Media Strategies maps the complex and disruptive media environment for the communication professional and provides the tools and methods to work effectively within it. Increasingly, communication professionals need to be accomplished content managers, capable of employing an arsenal of multi-media tactics across different platforms. 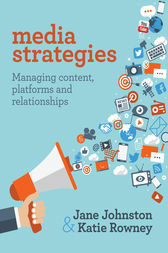 This book presents new and innovative approaches to media relations, brand journalism and content management, providing practitioners with the tools to creatively develop, share and deliver strategic media assets and ideas that cut through the cluttered digital environment. The authors also demonstrate that personal and traditional skills are as important as ever, including the ability to tell stories, create memorable media pitches, write and lay-out media materials, and develop credibility and trust in relationships. Media Strategies sets a new agenda for anyone seeking to build a career as a professional communicator. It includes examples from around the world, from corporate, political, government, not-for-profit and activist communication and public relations practice.